-Provides first-hand knowledge by Omar Yaghi, one of the pioneers in the field, and his team. 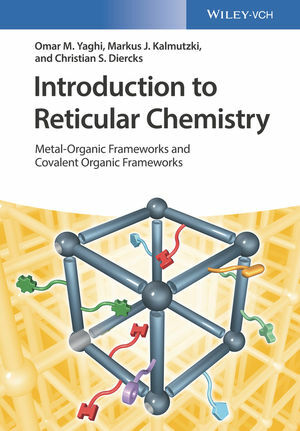 Aimed at graduate students in chemistry, structural chemists, inorganic chemists, organic chemists, catalytic chemists, and others, Introduction to Reticular Chemistry is a groundbreaking book that explores the chemistry principles and applications of MOFs, COFs, and ZIFs. Omar M. Yaghi is the James and Neeltje Tretter Chair Professor of Chemistry at University of California, Berkeley, and a Senior Faculty Scientist at Lawrence Berkeley National Laboratory, USA. Markus J. Kalmutzki is a principal scientist at Parr Instrument GmbH in Frankfurt, Germany. Before he was a DFG-postdoctoral fellow in the group of Omar M. Yaghi at the Universtity of California, Berkeley. Christian S. Diercks is currently pursuing his Ph.D. in the group of Omar M. Yaghi at the University of California, Berkeley.